Microsoft is pushing out a new Windows 10 Insider preview build 15025 for PC. The latest Windows 10 Creators Update (Redstone 2) build 15025 is now available for fast ring insider members. 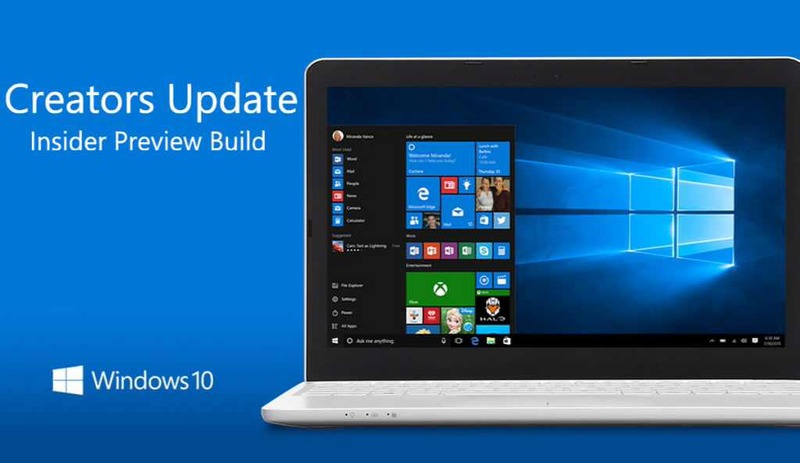 Previously, the company released Windows 10 PC build 15019 and mobile 10.0.15014.1000 for insiders. If you are facing issues with build 15025 like error 0xC1900401, build not yet available, download stuck at 0%, high CPU usage issue or other problems with the latest build, check out workaround here. According to the Windows Insider team, they have discovered a bug that impacts their ability to release this build to PCs running 32-bit (x86) versions of Windows 10 Insider Preview builds. so the team is not releasing 32-bit PC build. However, Windows Insider team will release Windows 10 Insider preview build 15025 ISO by the end of the week and Insiders on 32-bit PCs will be able to update from the ISOs. Announcing braille support in Narrator: Windows 10 Insider preview build 15025 brings braille(beta) support for Narrator. However, Insider team also warn that there are coexistence issues with braille support and third party screen readers. According to the Windows Insider team, braille be enabled for Narrator only on PCs that do not also have a third-party screen reader configured to use a braille display. New mono audio option in Ease of Access settings: Visually impaired users use a screen reader application to read the PC screen content and information to them, and frequently use headphones or earbuds to hear the computer when in meetings or having conversations with others. When doing so, they generally use only one earbud to hear the PC in one ear so the other ear is free to hear conversations and sounds around them. That can cause them to not hear sounds that may be directed to the other earbud. In order to change the sound to be mono mode and so all audio is directed to both ears, they used to need a physical earphone adapter. With Windows 10 Insider preview build 15025 you can now switch your audio to mono straight from the new Audio section under Settings > Ease of Access > Other options. Introducing Collections in Feedback Hub: Windows 10 Insider preview build 15025 includes Collections. A Collection groups together feedback for similar problems and suggestions into single items that bring together all the voices who expressed that sentiment in one place. The new Collections are now live in Feedback Hub starting with app version 1.1612.10251.0. [GAMING] Windows 10 Insider preview build 15025 fixed the issue where clicking on certain elements in desktop (Win32) games causes the game to minimize and cannot be restored. Windows 10 Insider preview build 15025 fixed an issue Insiders may have experienced where the Network flyout would unexpectedly appear blank instead of listing available Wi-Fi networks. Windows 10 Insider preview build 15025 fixed an issue where the custom color picker in Color Settings might stop working when selecting new colors. fixed an issue where certain colors in the recent colors section of Colors Settings would unexpectedly not appear selected after being selected. fixed an issue where if you downloaded a theme from the Store, deleted it, then downloaded it again, it wouldn’t appear in Themes Settings. Windows 10 Insider preview build 15025 improved the performance when using point erase to ease ink in Sketchpad. Windows 10 Insider preview build 15025 updated the Windows Ink Workspace so it will now remember your most recently selected stencil (ruler or protractor) and keep that choice the next time you open Sketchpad. Fixed an issue where, after upgrading, some Insiders were left with certain tiles that couldn’t be unpinned from Start. Windows 10 Insider preview build 15025 also fixed an issue where pinning a tile might unexpectedly add it in the middle of an existing group of tiles. build 15025 fixed an issue where desktop shortcuts pointing at URLs weren’t working for some Insiders. build 15025 fixed an issue resulting in not being able to tab over to Other Users section on the login screen using only the keyboard. Fixed an issue resulting in Microsoft Edge sometimes freezing for a short after using CTRL+C to copy selected text in the address bar. Fixed an issue resulting in the shadows behind the set aside tabs in Microsoft Edge not being as dark as expected – the thumbnails should pop more now. Fixed an issue with notification toast priority from recent flights where an alarm or skype call toast would not interrupt a reminder toast. Windows 10 Insider preview build 15025 fixed an issue where some captive portal Wi-Fi networks might fail to connect during OOBE, and if a captive portal network was using DNS hijacking to redirect to a secure site, the captive portal app would crash and you wouldn’t be able to clear the portal. Fixed an issue where Yes/No voice commands in the Wi-Fi portion of OOBE weren’t working. fixed an issue resulting in the screen flashing and explorer crashing in a loop for some Insiders if they entered Safe Mode on recent builds. Windows 10 Insider preview build 15025 fixed an issue for devices with TPM chips on 15019 where the TPM was unexpectedly not able to start. Windows 10 Insider preview build 15025 fixed an issue where a window might appear to get “stuck” on the mouse when releasing it after dragging to resize it – requiring an extra click to let go. Fixed an issue resulting in poor quality scaling of taskbar and task view thumbnail previews. We also fixed an issue where periodically when you moved your mouse to hover over a taskbar thumbnail preview, it might unexpectedly immediately dismiss. While Windows 10 Insider preview build 15025 fixed the primary bug causing this issue, some Windows Insiders may still hit nonstop exceptions in the Spectrum.exe service causing their PC to lose audio, disk I/O usage to become very high, and apps like Microsoft Edge to become unresponsive when doing certain actions such as opening Settings. As a workaround to get out of this state, STOP the Spectrum.exe service and delete C:\ProgramData\Microsoft\Spectrum\PersistedSpatialAnchors and reboot. For more details, see this forum post. [GAMING] With Windows 10 Insider preview build 15025 Certain hardware configurations may cause the broadcast live review window in the Game bar to flash Green while you are Broadcasting. This does not affect the quality of your broadcast and is only visible to the Broadcaster. Windows 10 Insider preview build 15025 Microsoft Edge F12 tools may intermittently crash, hang, and fail to accept inputs. In Windows 10 Insider preview build 15025, some Tencent apps and games may crash or work correctly on this build. Windows 10 Insider preview build 15025 Action Center may sometimes appear blank and transparent without color. If you encounter this, try moving the taskbar to a different location on screen. The Desktop App Converter Preview (Project Centennial) will fail to run on the Windows 10 Insider Preview Build 15025. If you are a developer utilizing the converter tool to convert your desktop app to UWP, we suggest skipping Build 15025 or switching to the Slow ring until we can fix this issue. [GAMING] An issue due to a kernel change which may affect some games that use copy protection technologies.